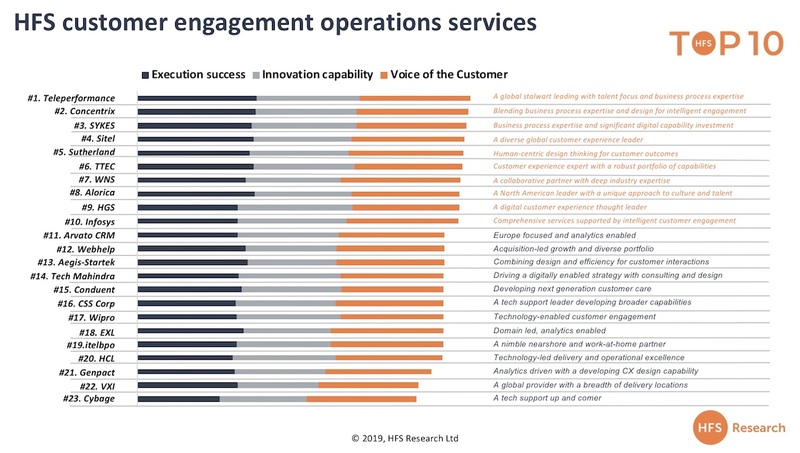 As the dust settles on our latest Top Ten, an assessment of the Customer Engagement Operations market, we’ve been fielding lots of questions about what this ranking means from a competitive standpoint. Our final top ten chart was chock full of what you might consider to be the usual contact center suspects, but also sprinkled with some interesting up-and-comers, as well as familiar names that aren’t necessarily known for competing in this space -- the intelligent customer engagement services that are evolving out of the contact center. 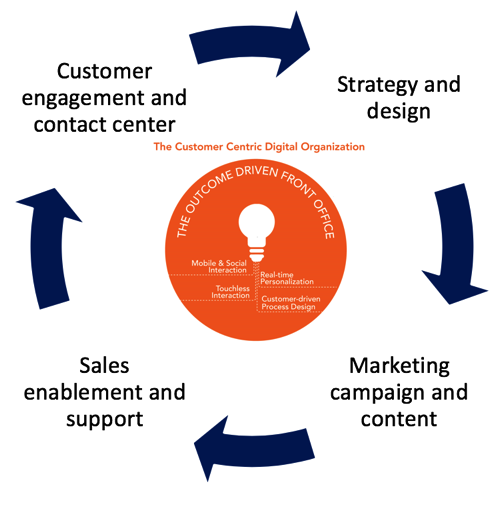 The promise of digital customer engagement and the vast amount of data in contact centers has brought back a resurgence of excitement for services that have evolved out of the legacy call center, and traditional labor focused legacy services are slowly but surely shifting to embrace automation, analytics, and digital interactions to provide a balanced, more intelligent customer experience. It's clear that this isn’t your dad’s customer care BPO market. While suddenly every service provider we talk to wants to carve out a name in this space, there are different roles each will play and fit into within the ecosystem. This report focused on the interactions management and operations piece of the puzzle, but actually, the three pillars of the value chain are intrinsically linked, with front office convergence creating demand for operations to leverage strategy, and vice versa. Pivoting to the digitally enabled front office means that customers are demanding more strategic input from partners at all points of the customer lifecycle. The recent investments we’ve seen from service providers for digital and design assets are complementary or integrated services to customer engagement operations. Thus, the services market is looking a lot less like a linear value chain and more like a cyclical system (ee below), where the contact center feeds strategy and design with customer data and analysis, where marketing, sales and support blur as one “experience,” and RPA, smart analytics and AI fuel the whole digital front office with greater efficiency, intelligence, and intuitiveness to customer needs. Our next HFS Top Ten reports will take a deeper look into the market for CX strategy and design, and marketing and sales services. It’s a seismic shift particularly for organizations that are aligning to OneOffice and thus why we see such a different competitive set than we have in the past. Fundamentally different capabilities are coming into play in the realm of intelligent customer engagement, with bold moves like SYKES acquisition of Symphony Ventures shaking up the space with some real RPA capabilities. Firms like Infosys, Tech Mahindra, HCL, Wipro and CSS Corp are actually embedding automation into engagements, often in the form of cognitive assistants. We even see some action in this space from the likes of Accenture, which have come in with a CX consulting slant and then operationalize to support the design, or have an industry-specific capability that they’re supporting with customer interaction operations. It’s worth noting that while the traditional contact center players tended to score well in the execution categories, there was a difference in the ranking for the innovation investment and capabilities, which was largely led by more IT focused firms. Thus, while now we still see the traditional service providers winning overall and in the voice of the customer in this market, in the future it may not be the usual suspects, but the providers that leverage niche and complementary capabilities, digital marketing, and CX design assets for their operations to be winning in the future. The demand from customers has fundamentally changed to shift away from low-cost, low-value services to seeking a partner that can help to deliver on a holistic digital customer engagement strategy, and many service providers are stepping up to the challenge. We expect the waters to muddy further as the impact of digital self-service, RPA and intelligent automation and AI accelerate. While on the one hand an existential threat, it is also the opportunity to breathe new life into a services market that for too long had been a race to the bottom for FTE based pricing. The convergence of services in the front office space means that enterprises need to choose their partners wisely. As an enterprise buyer, you will need to evaluate your partners and decide whether the partners you have today are the ones to help on your journey to deliver on intelligence customer experience. You will also need to open up to emerging business models and shed legacy contracts in order to really embrace an outcomes-focused front office that caters to its customers. 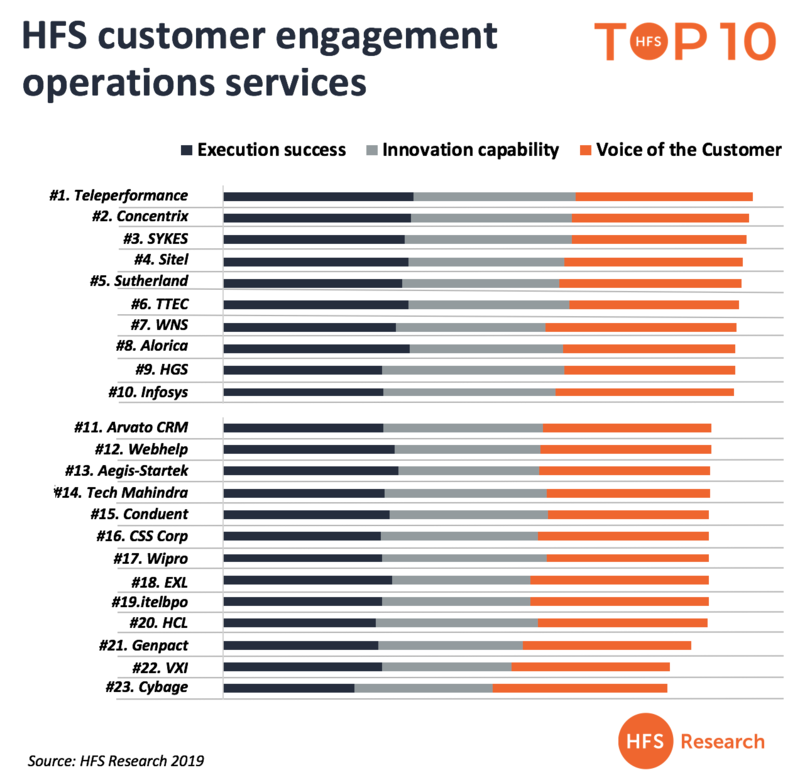 HFS subscribers can click here to download a complimentary copy of the new Top 10 Front Office Customer Engagement Services, 2019.